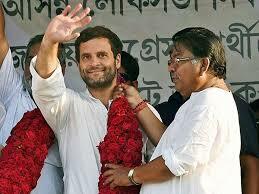 Congress President Rahul Gandhi addressed a rally organized in the Malda district of West Bengal on Saturday. As soon as the rally began a state of utter confusion and chaos was aroused due to a huge crowd present to listen to him. However, no injuries have been reported so far. The incident took place when Rahul Gandhi along with senior party leaders including the party's Bengal unit president Somen Mitra and Congress MP Gaurav Gogoi were present. In Kalom Bagan Ground in the Chanchal area of Malda, many people reached the barricades and entered VIP circles. Some people were also seen throwing chairs to the local Congress leaders in front of the platform. State Congress leader Amitabh Chakraborty said, "The space was limited. A large number of people had come to see their beloved leader. Our workers and the police took care of the situation. There were no injuries." Many senior Congress leaders, including former party MP Deepa Dasmunshi, repeatedly appealed to sit and calm people.